Happy New Year! On the eve of 2019, I wanted to share some of the greatest hits about our clients at 360bespoke this year. It has been an honor working with such talented artists and luxury brands, and I am heartened by the response from our friends in the media. Here’s hoping the next year is as successful. Our favorite “hit” of the year is from Vanity Fair, which profiled Charlie Siem in May. He was photographed in the Steinway & Sons factory in Queens for the feature late last year, where he also performed with fellow musician Joachim Horsley a rendition of "Scheherazade" in a Cape Verde Style. He was also interviewed by Ralph Lauren’s RL Magazine and by Britain’s The Guardian about his personal style and how he was influenced by his father, Kristian Siem. Celebrity florist Jeff Leatham, who designed the Kardashian family’s annual Christmas party last week, was profiled in a fantastic piece by Bloomberg BusinessWeek. In addition to his Los Angeles studio, Leatham serves as artistic director for both the Four Seasons George V in Paris and the Four Seasons Beverly Hills. The new pop artist Sasha Siem, whose new album Holy comes out this spring, was profiled in September by Town & Country and in New York Lifestyles. Sasha, who is also a song writer and cellist, has two previous albums, Most of the Boys and Bird Burning, which were hailed as “a rhapsodic Fiona Apple-meets-Joanna Newsom” (Stereogum), “an uptown fusion of Bjork, The Raincoats and the Cosmopolitan letters page” (Uncut) and “Sweeping, widescreen grandeur... both contagious and quite affecting” (Clash). She debuted her first single “Flower Flower” under the moniker Frigga, which caught the attention of Hollywood’s guiltiest pleasure Naughty Gossip. The professional home and office organization company Horderly, begun by Jamie Hord and her husband Fillip, was featured in both Domino magazine and New York magazine’s Strategist. Jamie’s clean, crisp aesthetic coupled with Fillip’s business savvy has established Horderly as the company to watch in 2019. Looking ahead to 2019, we are excited to begin working with the men’s lifestyle brand FLY. 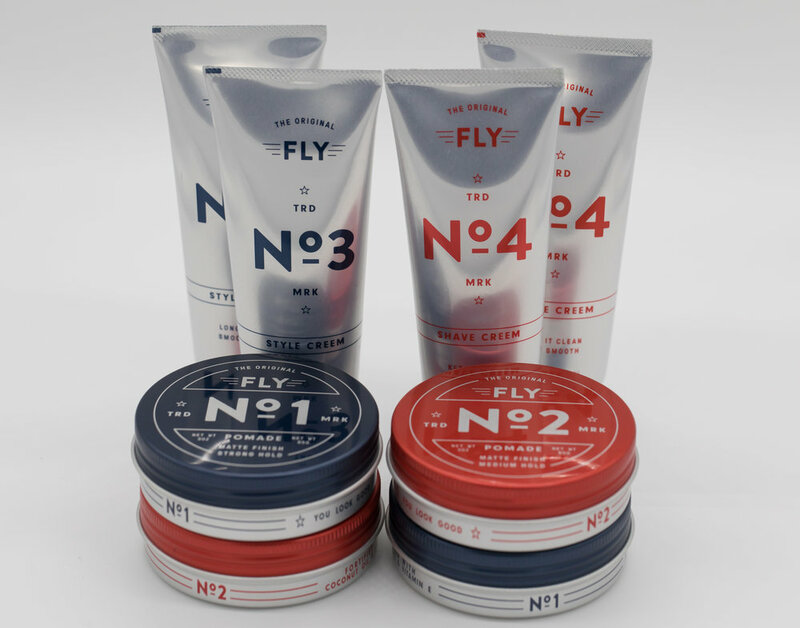 Combining the swagger of Steve McQueen with the classic elegance of Clooney, Gosling and Reynolds, FLY goes back to basics to give men grooming products seeped in time and tradition. Founded by Ted Hoffman, who gave up a career on Wall Street to start the company, FLY owes its origins to a vintage Airstream, where the entrepreneur launched an old-school barbershop. Soon, a growing clientele of style conscious men who appreciated the throw-back vibe of the trailer convinced Ted there was more to FLY than just a location. It was an attitude. Starting with two blends of hair pomade, he expanded the FLY line to shaving cream and then candle. Now available online and in select grooming salons across the country, the FLY line will expand in 2019 to include more essential products to the modern man’s lifestyle. Finally, we were gratified to receive press on ourselves with features in both New York Lifestyles and Resident magazines. Check them out! As fall begins, 360bespoke would like to take a moment to share press and accolades about our clients through the summer, and their plans for fall. From new singer Frigga, the brilliant celebrity florist Jeff Leatham and skin care genius Deborah Mitchell to counter tenor Iestyn Davies and violin sensation Charlie Siem, summer and fall has/ will be incredibly busy. 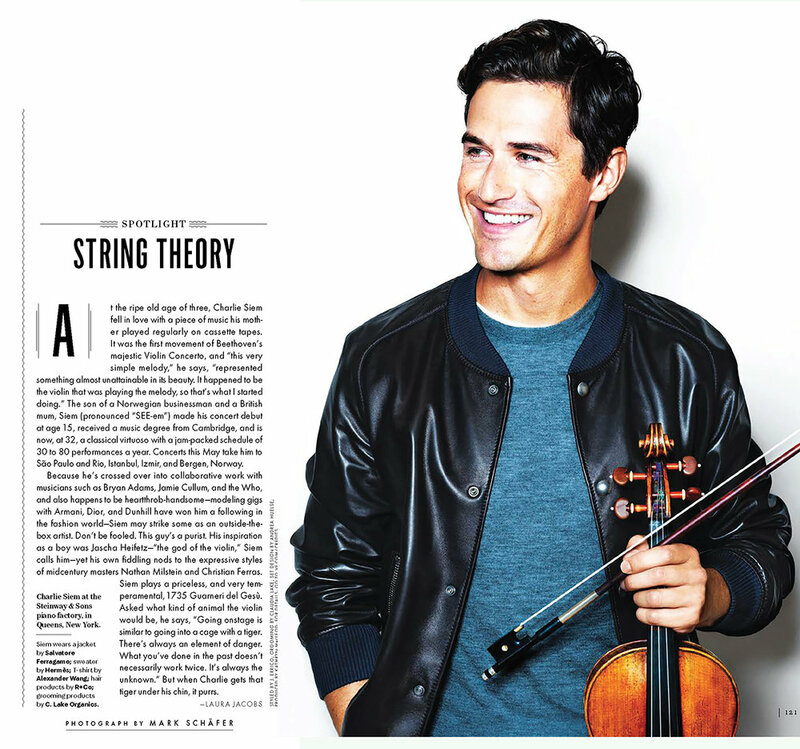 Celebrity violinist Charlie Siem, who has also graced ad campaigns for Dior and Giorgio Armani, continues touring around the world performing with the most prestigious orchestras and music houses. On the heels of his May feature in Vanity Fair, Siem performed with conductor Roger Apple earlier this month at the Saarländisches Staatstheater in Germany, playing renditions of three classic symphonies, including Modest Mussorgsky’s “A Night on Bald Mountain”, Gabriel Prokofiev’s Violin Concerto "1914" (German premiére) and Witold Lutoslawski’s Concerto for Orchestra. On November 7th, he will perform Mendelssohn’s “Hebrides Overture,” Tchaikovsky’s “Violin Concerto in D major op.35” and Sibelius’ “Symphony No. 2” with conductor Jac van Steen. And on Nov. 11, he will perform with pianist Itamar Golan at the Den Norske Opera and Ballet in Oslo. World renowned florist Jeff Leatham is profiled this month in a fantastic piece by Bloomberg BusinessWeek. In addition to his Los Angeles studio, Leatham serves as artistic director for both the Four Seasons George V in Paris and the Four Seasons Beverly Hills. His designs, especially in the George V, have earned him international acclaim and a bevy of celebrity fans, including Madonna, Cher, Tina Turner and Dolly Parton. He is also the go-to florist for the Kardashian family, designing their parties, weddings and family engagements. Well done, Jeff! The offbeat, Cote d’Azur-inspired lifestyle brand Vicomte-A released its new fall/winter collection, which it calls “always elegant but sometimes impertinent. Traditional and yet Audacious. Quirky but not frivolous, eccentric but always refined. Often ironic but never facetious. Colorful but not garish. Resolutely French yet always positive. Rooted in its values but always modern. Confident but never nonchalant.” We couldn’t have said it better ourselves. 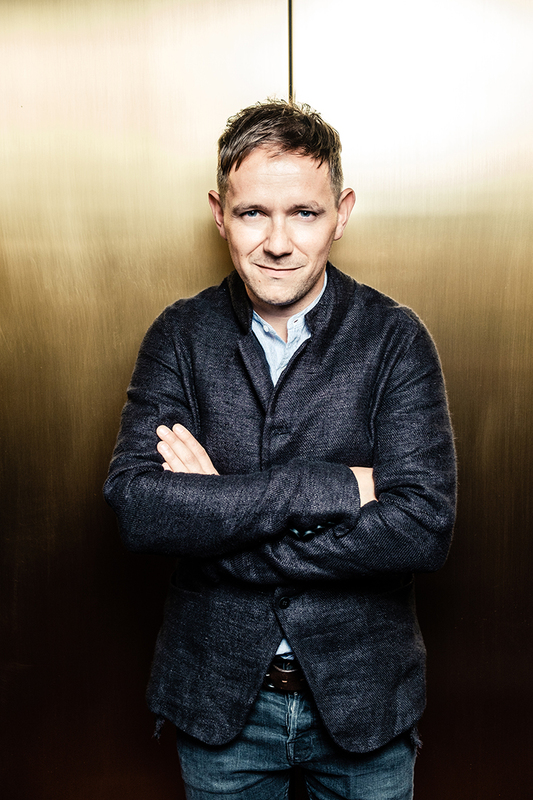 The world-acclaimed counter tenor Iestyn Davies will perform “Marni” at the New York Metropolitan Opera this month (Oct 19-Nov 10). The opera, composer Nico Muhly’s second for the Met, is a gripping reimagining of Winston Graham’s novel about a beautiful, mysterious young woman who assumes multiple identities. Director Michael Mayer and his creative team deliver a fast-moving, cinematic world for this exhilarating story of denial and deceit, which also inspired a film by Alfred Hitchcock. Mezzo-soprano Isabel Leonard sings the enigmatic Marnie, and baritone Christopher Maltman is the man who pursues her—with disastrous results. 360bespoke advisory family continues to expand with three new members: social media genius Sarah Karp Ward, digital product and UX expert Kenny Kim and luxury connoisseur Jack Ventimiglia. They join a fantastic group of industry-leading professionals who have been invaluable in providing advice and direction to 360bespoke. Also, we are honored to have been featured this summer in both New York Lifestyles and Resident magazines. Check them out! The professional home and office organization company Horderly, begun by Jamie Hord and her husband Fillip, is raising its brand awareness across the country, thank to Jamie’s clean and sophisticated aesthetic. Horderly was featured in both Domino magazine and New York magazine’s Strategist. "I feel like this day and age, organizing has become an absolute need," says Hord. "Humans consume so much, and we have become very materialist. A lot of my clients are organized; they just don't have the time to do it themselves. You will literally feel 10x lighter after you declutter! Studies show that it leads you to eating better, especially when you are organizing your fridge and pantry - you are keeping any old or perished food out thus causing less food poisoning/sickness. Cut down immensely on stress will make you happier.. Less stress and more happiness leads to better everything .. Less clutter will mean less cleaning up which means more time to do what you love. It will help you sleep better. Make your bed every morning will help you sleep better at night and get more done during the day (making you feel accomplished right away). There are just do many benefits." Greetings from 360bespoke. We are very proud to launch our very first newsletter highlighting the goings-on of our clients this winter. 360bespoke was founded last year with a collection of talents and brands who epitomize the very best in their fields, and we are incredibly honored to serve as their agency of record in telling their stories to the public at large. This February you will see many news items and events from our clients, from concert dates to sponsorships, new albums and products and appearances around the globe. We are very excited to share these news-worthy events with you. Please contact Press@360bespoke.com should you desire further information or press materials. Charlie Siem, violin virtuoso and international style ambassador, announced his first Australian Tour "Spiritus Mundi" with the Sydney-based Omega Ensemble. The first performance will take place in Castlemaine on March 24th, with several performances across Victoria and New South Wales. Tour stops include Castlemaine, Albury, Crackenback, Orange, Cessnock, Newcastle and Sydney. -- www.charliesiem.com -- which includes his worldwide performance schedule, music samples, video, photography and detailed biographical info. Siem also recently graced the New York Times Style section. Times writer Elizabeth Paton joined Charlie in London to discuss his passion for classical music and how he has bridged the gap between classical musicians and fashion. France's most talked about fashion brand, Vicomte-A, has debuted its spring/summer collection, influenced by founder Arthur de Soultrait's cheeky, mischievous humor, royal lineage (yes, the Vicomte title dates back to Louis XV) and Cote d'Azur lifestyle. The brand continues to make waves throughout Europe and Asia, with plans to hit the US market soon. Jeff Leatham, the celebrated Artistic Director of Four Seasons Hotel George V, Paris, recently added the Four Seasons Los Angeles at Beverly Hills to his portfolio. Now bi-continental (he flies between the two cities), Leatham is responsible for the lobby and public displays of two of the hotel company's most acclaimed properties. The celebrated artistic director also opened his very first standalone floral boutique in the lower lobby of the Los Angeles hotel. World renowned opera star Iestyn Davies recently released his new album -- Bach: Cantatas Nos. 54, 82 & 170, with Arcangelo, conducted by Jonathan Cohen -- to critical acclaim. "The catalog offers a remarkable range of individual vocal timbres which seem to influence interpretative parameters to a startling degree," wrote critic Jonathan Freeman-Attwood in Gramophone magazine. This spring, Davies travels across the pond for a series of concerts in the US, beginning March 1-5 in San Francisco with the Philharmonia Baroque, America’s period instrument ensemble, and conductor Jonathan Cohen. The program, entitled Operatic Heroes, explores how the new countertenor voice has led to the revival of Baroque opera and includes repertoire such as arias from Handel’s Saul and Theodora; works from Hasse’s Didone Abbandonata; and arias and dances from Telemaco and Orfeo ed Euridice by Gluck. Davies continues his US tour with Bach’s oratorio St John Passion with the Cleveland Orchestra and Chorus March 9, 11 and 12 at Cleveland's Severance Hall. There, he will perform with a cast that includes Maximilian Schmitt (Evangelist), Andrew Foster-Williams (Christus), Lauren Snouffer (soprano), Nicholas Phan, conducted by Franz Welser-Möst in this repertoire staple. Look for Iestyn Davies in the January 2017 issue of Gramophone. Here's a preview of the feature. Celebrity beautician Deborah Mitchell, the founder of Heaven Skincare and creator of the Bee Venom mask, has earned notoriety on pond sides of the pond for the immaculate skin of the Royal Family. Now, Mitchell is sharing her signature facial treatment, the Bee Peel, which includes a unique, fresh formula helps boost the production of collagen that increases the strength, elasticity and thickness of the deeper layers of your skin. The Bee Venom products are also a favorite of former first lady Michelle Obama. Heaven products are sold throughout Europe, Asia and the Middle East and available to US consumers online at www.heavenskincare.com. One of music's most promising new talents, 18-year-old pianist Thomas Nickell, will take the grand stage at Carnegie Hall for his solo debut on Sunday, February 26th. The performance will be the North American premiere of highly acclaimed British composer David Matthews' Piano Concerto, Op. 111 with Orchestra of the Swan and Music Director David Curtis. Tickets can be purchased by visiting carnegiehall.org or the box office at the performance hall on 881 7th Avenue, at the corner of West 57th Street. Student and senior discount tickets are available at the box office. Hello Gorgeous, a beauty and fashion blog run by Angela Lanter, has started a new personal and relatable segment posted once a week called “Girl Talk Tuesday (GTT)”. The new feature is a way to educate and communicate with girls on subjects such as love, relationship struggles, date ideas, life hacks, personal stories, critic reviews, and much more. Lanter's interactive process helped her compete in Allure magazine’s Beauty Blogger of the Year Award; she was also honored with the “Spotlight Award” for Blogger of the Year by PopSugar. Master craftswoman Lexi Tavel, the creator of Two of Wands, has teamed up with America's oldest yarn company, Lion Brand Yarns, to release new signature patterns and collaborations. Lexi is also busy designing a spring knitwear capsule collection for We Are Knitters. In addition, Two of Wands will soon be launching a Home collection - featuring blankets and throw pillows inspired by different regions of the world. Look for Bertil Espegren in an upcoming issue of British GQ. Bertil linked with photographer Neil Gavin and model Ashley Smith for a 10-page fashion spread, photographed in New York City. NEW YORK, Dec. 5, 2016 -- Young Steinway Artist Thomas Nickell will make his official solo debut at Weill Recital Hall at Carnegie Hall on Sunday, February 26, 2017, at 1:30 p.m. The 18 year-old pianist, who has garnered international recognition for his energetic, refined, and focused performances, will give the North American premiere of highly acclaimed British composer David Matthews' Piano Concerto, Op. 111 with the Orchestra of the Swan and Music Director David Curtis. Nickell has already been heard as soloist with Chicago's Oistrakh Symphony under the baton of Mina Zikri, and in Poland with the Sinfonia Viva chamber orchestra, conducted by Tomasz Radziwonowicz. The classically trained pianist has toured as a recitalist throughout Europe, the United States, and Japan. His February 26 performance will also feature Mozart's Piano Concerto in A Major, and Benjamin Britten's Variations on a Theme of Frank Bridge (for orchestra only), as well as solo works for piano by Olivier Messiaen, Henry Cowell, Wagner/Liszt, and by Thomas Nickell himself. "Playing at Carnegie Hall is an honor for any artist, and I'm both excited and humbled to perform the work of such a respected composer with this wonderful ensemble," said Nickell. "I could not have asked for a better partner for this debut than Orchestra of the Swan, and their esteemed Artistic Director David Curtis." Tickets are $40.00 and can be purchased by visiting carnegiehall.org or the box office at the performance hall on 881 7th Avenue, at the corner of West 57th Street. Student and senior discount tickets are available at the box office. Composer David Matthews traces the influences on his musical language to his English background and interest in the works of Benjamin Britten, Michael Tippett, and Nicholas Maw, as well as to the Central European tradition, back through Mahler to Beethoven. He has been preoccupied with working in the great inherited forms of the past – symphony, string quartet, and lately oratorio – and finding new ways of renewing them. He was dubbed "among our most prodigious symphonists" by Paul Driver of the Sunday Times, and "a leading 21st Century exponent of the form" by Arnold Whittall in Gramophone. Celebrating its 21st anniversary this season, Orchestra of the Swan has received international accolades for its polished and spirited performances. "A joy to hear from start to exuberant finish, superbly played," wrote Gramophone, one of the most widely read and respected publications in the music industry. "You won't hear much better than this anywhere." The ensemble gives more than 40 concerts annually and in 2014 undertook its first tour of China. Branching out from the classical realm, Orchestra of the Swan has also toured the UK with Steve Harley & Cockney Rebel and James, with sell-out performances at London's Albert Hall. The original exhibit, called “Images et mode au Petit Palais” [images and fashion at the Petit Palais], was on view in Paris from Sept. 27, 2008, until Jan. 4, 2009. The exhibit comprised 400 photos of Demarchelier’s most recognizable work, including portraits of Princess Diana, Madonna, Linda Evangelista, Gisele Bündchen, Angelina Jolie, Keith Richards, Nicole Kidman, Tom Cruise, Oprah, Sting, Rod Stewart andChristy Turlington. Angela Debona Agency and 360bespoke are working together to bring Demarchelier’s exhibit to New York, and will be responsible for selecting a venue, sponsors and planning the event.